As mentioned earlier, I recently had the pleasure of a casual conversation with John Ringley, at one time the most trusted confidant of promoter Jim Crockett, Sr. 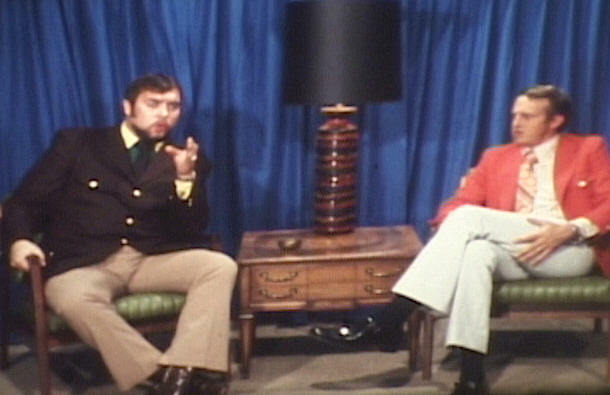 He had graciously agreed to talk with me for a feature I am constantly updating related to the old TV studio taping locations of Mid-Atlantic Wrestling. The following is another little "tidbit' about the wrestling and TV business in the early days gleaned from those conversations, plus a broader perspective on wrestling and TV's relationship in general. When Mr. Ringley and I began talking about the changes in presenting wrestling on television over the decades, one thing became clear: in the early days of TV, unlike today, professional wrestling was in an equal partnership with their television counterparts. Wrestling from New York and Chicago and the west coast had been a staple of national television in the 1950s. 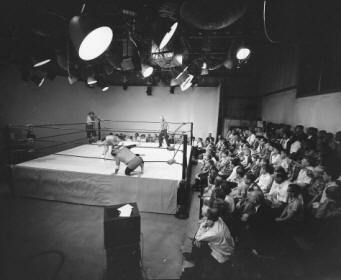 By the late 1950s, a growing percentage of programming on local stations began originating from the studios of those stations, and wrestling was one of earliest programs on local television. In 1958, Charlotte, NC television station WBTV partnered with local wrestling promoter Jim Crockett, Sr. to produce live televised wrestling bouts in Charlotte. The arrangement was advantageous for both parties. WBTV needed original local programming, and Jim Crockett benefited from an effective and far reaching way to promote his weekly wrestling cards at the Charlotte Park Center. At first, the wrestling matches were broadcast live. Later, as technology improved, the station began to record the matches on huge reels of videotape and air them later. Eventually, Crockett soon began similar arrangements with other TV stations including WGHP TV in High Point, NC and WRAL TV in Raleigh. Throughout the 1960s and into the 1970s, it was a barter arrangement with hardly any additional expenses for Jim Crockett Promotions. John Ringley explained how it worked at WBTV. "Things were so different back in the day as it related to expenses," Ringley said. "It was a partnership with television. For example, at WBTV in Charlotte - - the only expense [Jim Crockett Promotions] had was buying dinner for the television studio floor crew at channel 3. That was it!" And Big Jim made sure those boys always ate well. The relationship was one of near perfection. Crockett didn’t have to pay for studio time. WBTV didn't have to pay for the wrestlers or the matches. It was a simple arrangement, equally advantageous to both parties. Crockett promoted his upcoming live events in the area. WBTV got to sell advertising for the highly-rated program. The only other expense was of course to get the ring set up and torn down in the channel 3 studio, a task that fell to longtime veteran wrestler and trusted Crockett lieutenant Wally Dusek and his crew. The Crockett/WBTV relationship was put together by people at the top of each organization. "Charlie Crutchfield was the fellow we dealt with at channel 3," Ringley told me. Crutchfield was once president of Jefferson-Pilot Broadcasting Company which owned WBTV. He had been with the Charlotte based broadcasting company since 1933, where he was a host on 1110 WBT-AM radio. "He was a powerful man, with ties to the highest levels of government and of the Columbia Broadcasting System (CBS)," said Reno Bailey of Crutchfield on his BT Memories website. It is only fitting that James Crockett and Charles Crutchfield, two pillars of the Charlotte community for decades, worked together to make "Championship Wrestling" one of the early success stories of local television in the southeast. WBTV stopped taping wrestling in 1973 when all of Crockett's local TV tapings were consolidated to WRAL studios in Raleigh. "It was a great bunch of folks to work with for all those many years we did TV there (at WBTV), " Ringley told me. By the 1970s, Jim Crockett Promotions had developed a broad network of affiliated television stations. Their programs "Mid-Atlantic Championship Wrestling" and "World Wide Wrestling" were provided to the stations in exchange for commercial time to promote the local wrestling events in the surrounding areas. In turn, the TV stations could sell advertising during the other commercial breaks. It was known as "barter syndication" and wrestling was one of the first forms of programming to use that type of syndication. And just like in the 1950s and 1960s with the local station, it was a relationship mutually beneficial to both parties. "Mid-Atlantic Championship Wrestling has been furnished to this station for broadcast at this time by Jim Crockett Promotions in exchange for commercial consideration." By the mid-1980s, the TV landscape had changed dramatically and there was a glut of all sorts of different syndicated entertainment programing in addition to wrestling angling to get on local broadcast stations. The barter system was quickly dying and wrestling promotions began having to pay stations to get their programs on the air. The landscape for wrestling shifted again in the 1990s and into the new millennium with a slew of new national cable networks all looking for top rated programming. At the same time, wrestling had become a national television product, no longer a local or regional product syndicated to local stations. With the fierce competition between the national cable networks, the wrestling promotions could now sell their programming to the highest bidder, which is basically where we still are today, although only one promotion is left with any leverage and that is of course the WWE. But in the early days, there wasn't much shifting of advantage back and forth. The relationship between wrestling and television was equal and mutually beneficial and worked very well in that way, when TV time could be bought with sandwiches for the floor crew. Thanks to Mr. John Ringley for sharing that special bit of history with us.